Fancy a glass of red, overlooking this? Yes, please. 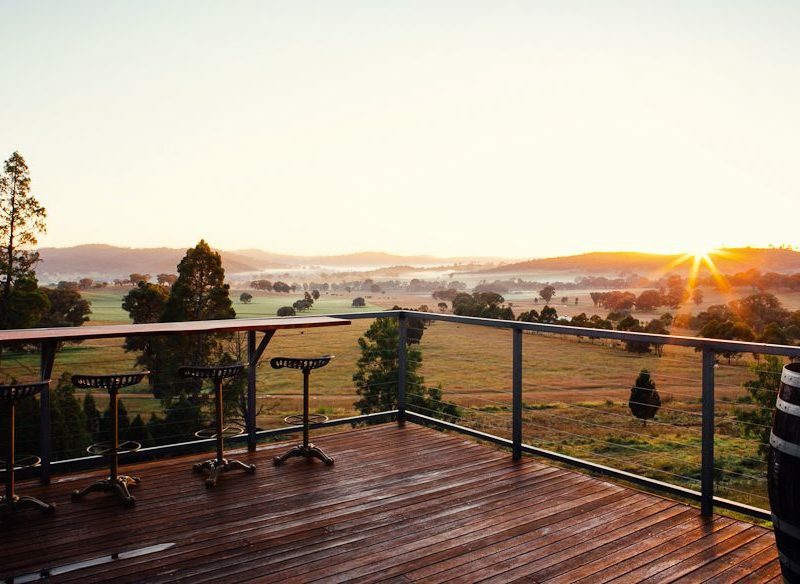 Sitting on a 52-acre property in the heart of Mudgee’s wine region is the luxurious self-catered Elouera. 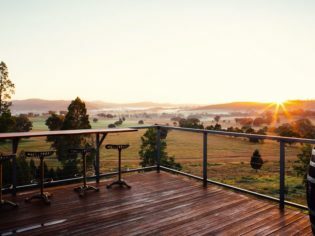 So it doesn’t have the prettiest sounding name (well that’s our humble opinion, anyway) but we think you’ll agree, after reading this, that the food, the folk and the very fine scenery in Mudgee more than make up for any minor quibble you face over its moniker. Isn’t it funny, though, how a name can have such influence? If only more people knew that, when the Wiradjuri people named this place, they literally meant ‘nest in the hills’*. Now that is an apt name. Farmers, viticulturalists and very lucky locals have lived here for centuries, but over the past two decades this gorgeous little nook, four hours’ drive fromSydneyin the central west of NSW, has become a preferred hideaway of tree changers and reformed urbanites, too. And, of course, we all know what happens when you mix wholesome country produce with hipster-slick café culture… take it from us, these 10 gourmet experiences are just the beginning. Roth’s Wine Bar showcases local talent on its menu of good food and even better wine. When your waitress tells you she wishes the shiraz cabernet she’s serving you was part of her blood stream, you know it’s going to be good (and that she’s certainly passionate about her job!). The drop in question is the Mudgee Blue Shiraz Cabernet 2011 cellared at Roth’s Wine Bar, which has been serving up delicious local wines since 1923. Prior to being licensed it was a general store, and story has it that there was an ‘under-the-counter’ business operating, serving beverages to farmers who travelled far and wide for a taste of the special concotions including 1080, Lucijet and Diesel, which are still made with a secret recipe and served here today. This watering hole is a local favourite, with a menu consisting of over 80 per cent local wines to savour with the delish wood-fired pizza and tapas.30 Market Street, Mudgee; 02 6372 1222. Na Lan, owner of 29 Nine 99 in Mudgee, makes over 300 dumplings every night. An Australian boy goes backpacking in China, meets a Chinese girl in Xian and, despite not knowing each other’s mother tongue, they fall in love. She moves across the world to little ol’ Rylstone (45 minutes south-east of Mudgee) and they start up local yum cha restaurant 29 Nine 99, named after the day they were wed. (Aww.) Who doesn’t love a good love story? Or a good dumpling for that matter. The cute couple, Na Lan and Reg, bring Beijing to the bush with their delicious handmade dumplings, which are so good, customers come from Orange, Dubbo, Narromine, and even Wellington for them. One character jets in on his private plane from Sydney just to take home an esky full of them. The restaurant itself is a riot of colour with gorgeous styling (a nod back to Na Lan’s previous life as an artist, no doubt) with adorable knick knacks also up for sale. Louee Street, Rylstone; 02 6379 1984. What a dish! The no-frills, fresh food approach at The Zin House is as amazing as it looks. A coveted weekend of family, friends, laughter, good food and wine can be found at The Zin House. Sitting in Lowes Wine vineyards, overlooking vistas of vines and farmland, the house is part of a 1000-acre, bio-dynamic and organically certified property. Here, a seemingly never-ending list of produce trees (mulberries, apricots, figs, quinces, strawberries, lemons…) has been planted, along with on-site eggs, honey, lamb, beef and herbs, for use in the six-course weekend lunch menu. These lunches are all about the social experience, the joy of food and the concept of sharing. Served on platters, the food is simple with no foams, no drizzles, no smears, no stacks, no fuss – just an easy focus on freshness and flavour. The food is a credit to owner Kim Currie, and her partner David Lowe can be thanked for the wine; both of which are best experienced through the wine flight, which is matched to the ever-changing menu. 329 Tinja Lane, Mudgee; 02 6372 1660. “Mudgee gets into your soul,” says Lara Brett, owner of Alby & Esthers – the spot to get your fix of two favourite vices, wine and coffee, which also get into your soul in a warm and fluffy kind of way. Named after Lara’s grandparents, this intimate leafy courtyard bar is tucked away off the main street. On the menu, you’ll find simple and hearty comfort food, locally roasted coffee (by Mark Newman of Yarrabin Road Roasters) and 40 per cent of the wines sport a local label. If you’re feeling inquisitive, the bar is also the venue for a gastronomy school with a roster of wine, truffle, coffee and chocolate classes. 61 Market Street, Mudgee; 02 6372 1555. The Cobb & Co Boutique Hotel is one of Mudgee’s oldest hotel buildings, dating back to the late 1850s when it was built as an overnight stop for the Cobb & Co Royal Mail Coaches. The lovely Wineglass Restaurant is housed in the shed where the coaches and horses were stored – in fact, you can still see the original shingle roof underneath the iron and the old hand-cut and plugged beams in the upstairs of the restaurant. Headed by Scott Tracey, who trained with Neil Perry, the restaurant’s menu is fresh and fantastic and all about cuisine du terrior, served up in an old-world, historical setting. 97 Market Street(Cnr Perry Street), Mudgee, 02 6372 7245. Fancy a schooner of Mudgee Mud? This interestingly named brew wasn’t always going to make Mudgee’s gourmet bucket list; it got its name back in the 20th century when the not-so-quality town water, which was used to make the beer, left sediment in the bottle. Despite the problem being fixed, the brewery that made it sadly closed in 1956. But now, almost 60 years later, the officially (and affectionately) named Mudgee Mud has been put back on the map by husband-and-wife team Gary and Debbie Leonard with the establishment of Mudgee Brewing Co. We actually suggest you start your day here (and end it, if you like) – they do a mean Brewers Breakfast of eggs, bacon, mushrooms and tomato on Turkish ($17). 4 Church Street, Mudgee; 02 6372 6726. Opened late last year, the rustic and charming Pipeclay Pumphouse at Robert Stein Vineyard is bringing the ‘paddock-to-plate’ philosophy to life with a seasonal modern Australian menu showcasing homegrown and locally sourced produce (see our review on page 44). Most of the veggies and herbs are grown on-site, the cattle, chicken and sheep are farmed here, and they’ve started to make their own prosciutto and cured meats. It’s all about family at the pumphouse: the chief winemaker is the grandson of Robert Stein, head chef is his brother-in-law Andy Crestani, both of their wives handle paperwork and marketing… “Is the waitress family too?” we ask Jacob. “Yeah, she is the sous chef’s mother.”Pipeclay Lane, Mudgee; 02 6373 3998. Market Street Café serves up French-style cooking with fresh Mudgee produce. Owner Aaron receives a box of produce from local supplier Sally. He doesn’t know what’s inside but he buys it anyway, because he knows the produce will be sensational. And Aaron nails his MasterChef-style mystery box every time, cooking up a changing menu of French-inspired comfort food. “The people of Mudgee are proud of what they do, they don’t try to be good at everything – they focus on one thing,” he says. The weekend menu at the cosy Market Street Café consists of three courses of the best local seasonal produce they can get their hands on. But one thing is a constant: the sourdough bread, which was inspired by a trip to France and has been refined over many years (and countless taste-tests on behalf of Aaron’s wife) to the quality loaves running out the door today. 79 Market Street, Mudgee; 02 6372 0052. When you place an order with Gerry (Norton-Knight, the vigneron), chances are it will be him on your doorstep a week later with your precious case of award-winning shiraz and caberent sauvignon, because it’s all about personal attention here… and art. Gerry’s wife Kay is an artist and her works are dotted around the vineyards along with Sculptor-in-Residence Maurice Berrie’s pieces. Art workshops are also run here throughout the year – from drawing to print-making to welding. Rosby is also known for its annual vintage launch – just $70 for a three-course meal with matching wines and a presentation from the vineyard’s wine connoisseur, only known as ‘The Oracle’. No doubt, you’ll be sleepy after such a hearty feed – luckily, there’s also a luxurious country homestead on the property to call home for the night. 122 Strikes Lane, Eurunderee. The biggest vineyard in Mudgee, at 547 hectares, is coupled with a world-class thoroughbred horse stud and home to a venerable series of wines, three of which are named after their horses – Don Eduardo, Crowned Glory and Desert War. Gooree Park is also the hostess with the mostest, with a packed calendar of events including Wine and Wagyu Barbecues – where the property’s own Angus and Wagyu steak is served – Stud Tours and Bubbly Breakfasts, high teas, private tastings and several race meets, where VIP tents are erected on the pretty property. 1154A – 1154B Castlereagh Hwy, Mudgee; 02 6378 1800. Elouera is located on a gorgeous 52-acre property, just minutes from the town centre. There’s a five-bedroomHomestead(from $550 per night) or the three-bedroom Carriage – a converted historic train – (from $390 per night). Both are luxurious, comfortable and self-catered.